The Romans, led by Agricola, built a fort in this area in 79AD! The Romans leave Britain and the Celts are invaded by the Vikings and enlist the Saxons to help fight them. King Alfred the Great negotiates peace with the Vikings and his daughter Aethelflaed, the 'Lady of the Mercians', builds a Burh at Warwick. In 1066 the Normans led by William the Conqueror, invade England and the Anglo-Saxon Sheriff of Warwickshire, Thorkell of Arden, turns traitor and supports William the Conqueror. The 'Traitor Earl' was one of only two Englishmen to retain his estates under William. In 1068 the Warwick wooden Motte and Bailey Castle was built and Henry de Beaumont holds the Motte and Bailey castle for William the Conqueror. His son, William Rufus creates the earldom of Warwick for Henry de Beaumont who changes his name to Henry de Newburgh. He is appointed as Constable of Warwick Castle. William Rufus also gives him the great estate of Thorkell of Arden thereby betraying the Traitor Earl! The History of Warwick Castle - the Wooden Castle is replaced with stone and under siege! The History of Warwick Castle moves on to the signing of the Magna Carta in 1215. In 1260 the wooden castle is replaced by a fortified stone castle. Unrest in the kingdom leads to the Barons War when Simon de Montfort successfully attacks and lays siege to Warwick Castle in which the castle was badly damaged by the mighty siege engines - the Mangonels and Trebuchets requiring the reconstruction of Warwick Castle in 1315. The reign of Edward III saw the great Chivalric Age and Warwick was the scene of many tournaments, feasts, banquets and processions. History also saw the start of the Hundred Years War between England and France. Thomas de Beauchamp, 11th Earl of Warwick, commanded troops at the battle of Crecy and Poitiers. The glorious Age of Chivalry was also marred by the Black Death and the Peasants Revolt (the first of all revolutions). Richard de Beauchamp, the 13th Earl of Warwick, served in France as Captain of Calais and supervised the trial of Joan of Arc. Richard III took ownership of Warwick Castle until he fell in the Battle of Bosworth Field to Henry Tudor. The Tudor Kings also keep Warwick Castle to themselves ensuring the power and influence of the nobility is contained! The History of Warwick castle enters another period of murder, executions, treachery and intrigue starting with the short reign of King Henry VIII's son Edward V. John Dudley is created the Earl of Warwick, Chancellor of England and Duke of Northumberland which makes him the most powerful noble in England. The young King was sick and Dudley realises that if the King dies, and either of his sisters take the crown, that Dudley will lose his power and probably his head. John Dudley plots with the Earl of Suffolk and arranges the marriage of his son, Guildford Dudley, to the Suffolk's daughter, Lady Jane Grey. The young king dies and Lady Jane Grey, John Dudley's daughter-in-law is pronounced Queen of England. She only reigns for nine days and the rightful Queen Mary takes the crown. The powerful John Dudley, Duke of Northumberland, was beheaded for treason. The earldom of Warwick is granted to the Rich family but Warwick Castle is passed to Sir Fulke Greville. 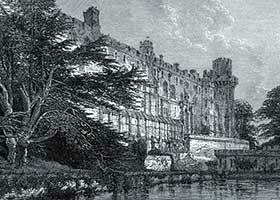 A poet and courtier Sir Fulke Greville was murdered and his ghost is said to haunt Warwick Castle. An ardent Puritan, Sir Robert Greville, Earl of Warwick, was imprisoned by King Charles I for refusing to take an oath to fight for the king. He became an active member of the parliamentary party. In 1642 Civil war broke out between King and parliament and Warwick Castle successfully withstands a siege by Royalist troops. Charles II was restored to the throne and the history of Warwick Castle saw its bloody role decline and the castle saw many improvements including those of Capability Brown who was employed by Francis Greville to lay out the grounds of Warwick Castle. The castle became palatial with some wonderful additions. The History of Warwick Castle survives two World Wars but is nearly destroyed by Fire! In 1978 the Earl of Warwick's son, David, sold the Castle to the Tussard's group, the company which owns Madame Tussaud's in London. The History of Warwick castle concludes as the Tussard's group carry out extensive restorations to the castle and open it to the public.